Fourth and final part of your Editor's secret diaries, faithfully kept through flood, fire, feast and famine. This time India and Pakistan. Plus the first published photograph of a new species of Trachycarpus which is set to take the palm world by storm! Click here to read them or to add your own. 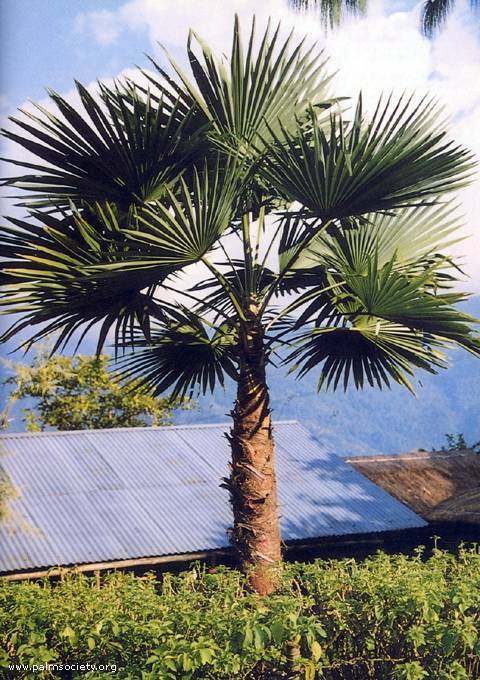 Left: First published photograph of the new Trachycarpus, T. sikkimensis in cultivation in Kalimpong, West Bengal. T. fortunei it aint! Right bottom: Camel laden with thousands of cut Nannorrhops leaves. Enough to give anyone the hump. After a disappointing trip to Burma (Myanmar) and an exhausting trek in Nepal where we only just about caught sight of the Trachycarpus martianus that we had endured so much to see, we flew out of Kathmandu to continue with the next leg of our trip. The domestic airport at Kathmandu is a zoo! Hundreds of people pushing and shoving, no flight indicators, only blackboards that contained information that may or not be current. However, one way or another, we find ourselves on our plane, heading south-west for the town of Biratnagar. It has nothing to offer the tourist, it is simply the nearest airport to that part of India we plan to visit, so a good jumping off point. At airports in countries such as India, we are usually surrounded by taxi drivers and their mates, all begging us to take their cab. This time it was different, with only one or two mini-van taxi's, whose drivers didn't seem to be bothered one way or the other. However, we eventually hammered out a price for the quite long distance to Darjeeling - £40 for the 5-hour trip, and set off east. The countryside was rather dull, very flat, mainly paddies and just a few, rather tropical palms. After dark we crossed the border from Nepal into India and went through the formalities, including having all our details recorded in a vast, dusty book, that nobody probably ever looks at. In fact the entire 'Foreign Registration' office seemed to be filled from floor to ceiling with similar books, and great piles of old papers, which presumably meant something to someone at some time, but now simply served to gather dust. After the town of Siliguri, we began to climb, and knew that we were on the last part of the journey to Darjeeling, which is at 2400m. The road was accompanied by the railway line of 'The Toy Train', a real but miniature locomotive that hauls both people and goods up to the town. We could see little from the mini-van, just hand painted signs that loomed out of the darkness, 'Drive with Co-operation, not Competition', 'Better Late in this World than Early in the Next', and similar exhortations to road safety. Also, one hand-painted, black and white striped bollard every 5m from the bottom of the hill to the top, a million of them. They probably never finish painting them. Eventually arrived at the famous Windamere Hotel - a real relic of Empire, enough nostalgia to satisfy even me. We had come here to check out two Trachycarpus palms that we knew were growing in the hotel garden. Our friend Henry Nolte from the Edinburgh Botanic Garden had photographed them the previous year but had been unable to put a name to them. A real challenge, and an easy and enticing side trip to add to our journey. Though it was 10pm, and pitch dark, and though we had no booking, the Windamere Hotel lived up to its reputation and provided a warm welcome. Outside, it was freezing cold, and with a mist worthy of the lake from which the hotel takes its name. A room was found for us, an electric heater, and as though that weren't enough, a hot-water-bottle apiece. As soon as we were able, and despite the lateness of the hour, we hurried out into the garden to check out the two trees, but if we had any idea that we would be able to recognise them instantly, we were much mistaken. They were certainly Trachycarpus, but which? Big, bare trunked, and with leathery leaves that were quite different from all other Trachy's we knew. We were sure only of what they weren't. To bed, under 47 blankets each, even more mystified than when we had arrived. Up after a good night's sleep, to discover a fabulous view, unsuspected in last night's darkness. Had what the guidebook described as 'the best porridge in India', which preceded a traditional English breakfast, complete with toast and marmalade. Spent the day in and around the town, including a visit to the Lloyd Botanic Garden, rather disappointing, many Trachy's but all T. fortunei. One exciting find there was a huge Caryota (Fish Tail palm), species uncertain, but it must be really hardy, since it snows here every year and it is, after all, 2400m. No more Trachy's like the two at the hotel, which are still nagging us. Arranged a car for tomorrow, to take us to Gangtok in Sikkim. Left Darjeeling late morning, it would take a few hours to reach our destination. On the way we saw first of all, one isolated Phoenix rupicola, a young plant, then a big Caryota like the one yesterday in Lloyd's, then Wallichia disticha - a wonderful two-dimensional palm - which we were delighted about, then finally a big grove of tall Phoenix rupicola, cultivated and beautiful, and bearing little resemblance to Phoenix canariensis and P. dactylifera, which seem coarse and vulgar in comparison. Carried on driving, crossing the famous Teesta river. On the other side along which we now drove, we saw wild Phoenix rupicola, but as the slope was north-facing they were impossible to photograph. Another interesting find was Calamus erectus, lots of them, growing along the roadside, spiny and gorgeous, and a first for us. The whole area was rather moist and jungly and we were surprised not to see more palms, it seemed perfect for them. There were, however, lots of palm-like Pandanus trees, with 10 or 20 feet of trunk, often growing in deep shade. Reached Gangtok eventually, and checked in at the Tibet Hotel, run by the Dalai Llama trust. Took a walk around the town but no palms and not much else to see, a bit dull, so returned to the hotel for a rather mediocre meal, then watched a bit of TV before retiring. Cold and greasy breakfast of fried eggs, tasting of fish. Packed, checked out and tried to get a taxi or other car to take us the 4-hour journey to Kalimpong, our next port of call, but as it is election day it is all but impossible. Eventually, the man from the hotel took us to the bus stand where we were able to get on a bus that was to leave for K'pong in half an hour. Quite comfortable and very cheap. Arrived at 4pm after a palmless journey, and walked to the Everest Hotel, an enormous improvement on last night, and very much in the Windamere tradition. In the evening made contact with friends of friends back in Europe, and spent a nice couple of ours at their house, talking palms. He has mature Wallichia densiflora in the garden, as well as one of those Caryota palms. Planned to leave K'pong by midday and as we had a little time to spare, decided to wander around the hotel garden. What should we find there but one of the same Trachycarpus we had seen in Darjeeling - identical! It is so distinctive there seems no explanation other than it is a new species, it is certainly no Trachy that we know. It has big, leathery leaves, a naturally bare trunk, and seeds/fruits that are oval and grooved, quite different from T. fortunei's kidney shaped seed. Ooooh! A new Trachycarpus! How exciting! The hotel owner, grandson of the original owners, offered to take us to Bagdogra in his mini-van, and off we set. A great journey with many palms, but as usual we had left too little time so could only stop a few times, and for a few minutes. However, we were able to 'clock' among others Wallichia disticha (lots of them, not the rarity we had expected) and many Phoenix rupicola. Resolved to return next year. Reached Bagdogra with minutes to spare and caught the plane for Delhi, this part of the trip over. Our next destination was to be rather different, well away from the green moist Indian hills, we were headed for the deserts of Pakistan, not on most peoples' list of favourite holiday destinations. However, we were not there to holiday. 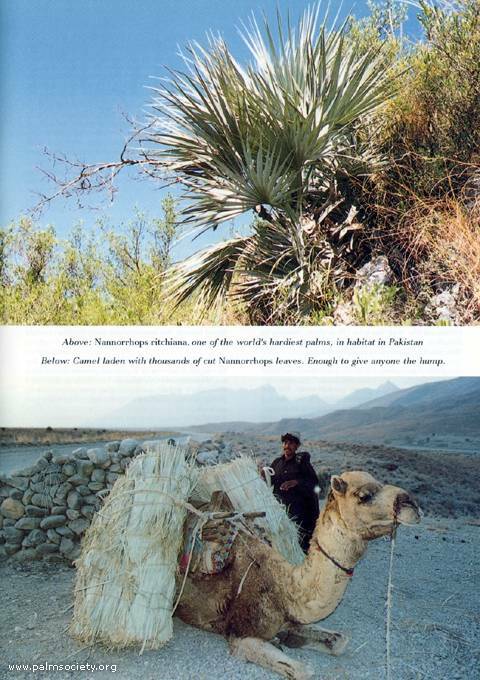 We were looking for Nannorrhops ritchiana, the Mazari Palm, and Pakistan is one of the few countries where it grows, and when a palm calls, we must answer. After spending some time in Delhi, we took a taxi to the airport and caught our plane for Lahore, Pakistan, where we arrived at 7pm. Changed planes here, and caught another, for Peshawar, arriving, exhausted, at 10pm. Took a taxi to town and checked in at the Galaxie Hotel, not too bad, but rather noisy. However, slept well enough. Left the hotel and took a taxi to the foreign registration office. This is the place to get a permit to visit the famed Khyber Pass, where Nannorrhops was reported as growing 100 years ago. Obtained the necessary paperwork, but with it came a guard with a Kalashnikov rifle who would accompany us in the taxi, a reminder that we are in a wild country. Drove for an hour or so, through rather flat, rather dull desert landscape until we reached the Pass. Though we strained our eyes there was not a single 'Nanny' to be seen. The view was quite spectacular, we could see almost into Afghanistan, but disappointing to see no Nanny's. Back, then, to the hotel, dropping the guard off en route, relieved that he hadn't needed to use his rifle. In the evening went to the cinema! A rather ancient place - goodness knows what European Health & Safety inspectors would make of it. Saw probably the very worst film I have ever seen (half of), and delighted to leave midway. Dinner at a local 'restaurant' then back to the hotel. Left sharp at 8am in a rented car-and-driver for our 3 day trip to what we hope will be Nanny-land. Left Peshawar in the direction of Attock, passed through Nowshera to the Indus river, from there to Pindigheb where we had a poor lunch, then via Talagan to Mianwali where we are staying at the Faizal Hotel, not too bad and quite cheap at 150 rupees/night. Up at 7, breakfast at 8, left at 8.30. Back down the same road but turned off in the direction of Chiddru, but unfortunately the road ended there (our map left something to be desired) and after consultation with some villagers, back-tracked, then on to Qualdabad, thence towards Sakesur, our first goal. The road was in a good state and after a few miles, it began to climb until we were high above the flat plain below. We were in the Salt Range of mountains and after climbing still higher, we came across our first Nannorrhops ritchiana in the wild. There were a few plants, growing at some distance from the road, the driver must have thought we were quite insane as we raced off to examine them. About 6 feet tall, with incredibly thick and leathery leaves, a pale blue/green in colour, growing in extremely arid conditions. Beautiful, at least to our eyes! After taking some photos we drove on, passing lots more plants and after they began to peter out, drove back to the best specimens where we stopped for an hour or so, taking photos and measurements and generally enjoying ourselves. After this, we attempted to continue on down the same road but we were stopped at some kind of road block and were told by the soldier who was manning it that we could not drive further, but would have to go back the way we had come. We never found out the reason, but didn't mind too much as it gave us the opportunity to go past the Nanny's again. Drove all the way back to Quaidabad, thence to Khushab where we decided to pass the night. Bad hotel, rather dirty, rather cheap. Up at 7, quick wash and out of this disgusting place. Skifezza! Headed towards Naushara on a good, double road. Hit the Salt Range again, and climbed to 850m but no sign of more Nannorrhops, despite a thorough search. The scenery was spectacular though with red rocks against a cloudless blue sky. Descending the far side of the range we came across the main road to the capital city, Islamabad, and headed along it, eventually reaching it at about 1pm. Islamabad is a new city having been built from scratch some 30 years. It has great wide 'boulevards' and is extensively planted with native trees and plants, and is thus very different from all other Pakistani cities. Checked in at a reasonable hotel, itself set among trees, then went out to explore the city on foot, eventually ending up at an expensive and not-too-good Western-style restaurant in a big international hotel. Pakistan is 'dry' in more than one sense of the word, and it was quite impossible to get even a glass of beer, much less anything stronger. Added to that was the fact that, by bad luck or bad planning, we had arrived on a 'meatless' day, so were reduced to vegeburgers with no beer! Up late and lazy breakfast. Slowly made our way to the airport where we are to catch a plane to Quetta, our next possible Nanny-location. Exciting views from the plane of amazing mountain and rock formations. Arrived Quetta after a short (1hr) flight, taxi into town where we are staying at the Qasr-e-gul. Not too bad. At the hotel, asked if we could rent a jeep and driver for a few days. After a while, a group of wild looking tribesmen arrived with such a vehicle. Haggled, but they were better at it than we and we settled on a high, though actually not-too-bad price, arranging to leave in half an hour. Off we set as arranged, the driver, his son, and we two. Drove to Urak, where we had high hopes of finding the palms, but no joy, so back into Quetta and out again by a different route, this time in the direction of Nakas, the railway station at which we had seen in an old photograph, surrounded by 6 ft. high Nannorrhops, hundreds of them. If they were anywhere, they would be here. We passed through some wonderful, wild scenery then we began to see the palms, first a few, then more, finally, thousands. They were considerably smaller than those we'd seen on the mountain, and the reason soon became obvious - these had all been pruned of leaves, probably regularly and often. We saw piles of cut leaves by the roadside and stopped to take a photo of a camel laden with bundles of them. The further we drove, the smaller the plants became until we got to the town of Nakas where we saw the smallest of all, just a few inches high, and still they were being pruned! Even though the leaves were tiny. Such a terrible shame! Pushed on to Hanai where we stopped for the night. There was a general power cut on thus we were not able to take a close look at the meal (of rather greasy mutton) that was served to us in our room, except by candlelight. Probably just as well. Set off through the Bolan Pass, quite biblical in appearance what with sheep, goats and groups of camels. The railway that accompanied the road was built by the Brits 100 years ago, to the year. The tunnels all had English names: Windy Corner, Braemar, Mary Jane. A bit odd to see those names here. Drove to Sibi on the way passing a wonderful oasis, with hundreds of Date palms, and what appeared to be permanent running water. A couple of hours further on and we were to see the last of the Nannorrhops ritchiana, growing by the side of the road in unbelievably dry and arid conditions. How they survive is a mystery. Taking a last look at the palms we headed back for Quetta, to get the plane to Delhi, and thence to London. Our 7 week trip was over, we had had some wonderful times and seen some wonderful palms. We had visited Thailand, China, Burma, India, Nepal and Pakistan and added much to our store of knowledge about hardy palms. Best of all, we had seen three new species of Trachycarpus. Watch this space! Check this box if you do not want your name and e-mail address to be published.